The SAS 9.3 depot subsetting option is an alternative to the client/server installation model used for earlier SAS releases for Windows operating environments. Subsetting your order makes it easier to distribute and conserves disk space. Note: A complete copy of SAS must be installed on each workstation. This SAS note covers three topic areas: It discusses the new SAS 9.3 depot subsetting option. It provides an overview of the client/server model for users and administrators. And it touches on the limitations of the SAS 9.2 client/server model. For more details about the subsetting option, see the SAS® 9.3 Intelligence Platform: Installation and Configuration Guide. The characteristics of the client/server model are described below. SAS 9.1.3 enables users to have a smaller footprint. With SAS 9.2, the footprint is not any smaller due to the Java Archive (JAR) files that are installed on the user's computer. For SAS 9.3, a subsetted depot is an alternative to an admin-client depot in order to get a smaller footprint. However, a complete copy of SAS must be installed on each workstation. In SAS 9.1.3, you can control the SAS installation data file. You have to update it in only one place. With SAS 9.2, you can silently apply the renewal license and set up a central licensing location. (See SAS Note 31021 "The Renew SAS® Software utility runs in quiet mode in SAS® 9.1 and SAS® 9.2.") With this model, you have to apply the license only once. See SAS Note 14856 "How to apply a setinit to multiple installations of SAS at one time." In SAS 9.1.3, you can apply hot fixes to the Client Users Depot. You then have to reinstall the end-users image. With the maintenance releases for SAS 9.2, you create a new SAS Software Depot and then perform a new installation. Because you cannot apply maintenance to an existing Client Users Depot, this does not save time for the administrators. See SAS Note 38936 "The order you are attempting to add cannot be included in an existing SAS Software Depot." With SAS 9.2, centralized license management runs in quiet mode. See SAS Note 31021 "The Renew SAS® Software utility runs in quiet mode in SAS® 9.1 and SAS® 9.2." "Provisioning Systems and Other Ways to Share the Wealth of SAS® Across a Network"
SAS Note 37041 "Tips and techniques for performing a SAS® 9.2 quiet deployment"
You can install the hot fixes silently. For SAS 9.2, see Silent Installation on page 14 in the Using the Maintenance Installation Tool to Install SAS® Hot Fixes - Usage and Troubleshooting Guide. For SAS 9.3, see Apply Hot Fixes on page 26 in the SAS® Deployment Wizard and SAS® Deployment Manager 9.3: User's Guide. With SAS 9.2, you can create a subsetted depot of selected SAS® Foundation products and SAS clients from your master depot. 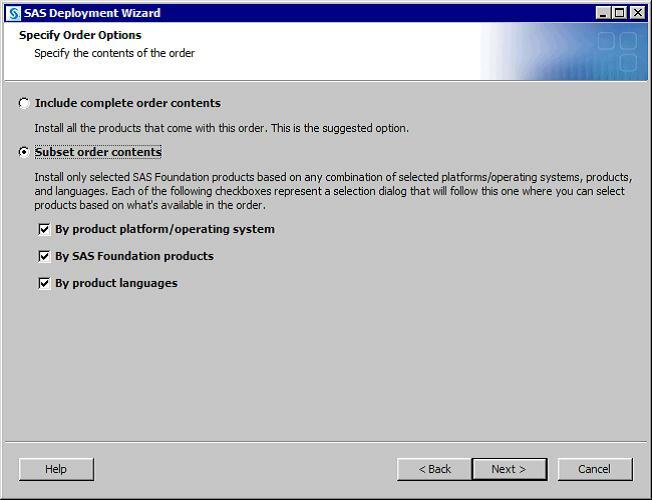 See SAS Note 39110 "Using the SAS® 9.2 Depot Subsetting Utility to create subsetted depots of SAS® Foundation products and SAS® clients in a Windows operating environment." There are several known limitations with the Client Users Depot in SAS 9.2. For more details, see SAS Note 40371 " Instructions for applying a hot fix to a SAS Software Depot for Client Users in SAS® 9.2." Note: If you intend to manage software depots for client users, then you should use SAS 10w34 or later. The SAS® 9.3 depot subsetting option is an alternative to the client/server installation model used for earlier SAS releases for Windows operating systems.